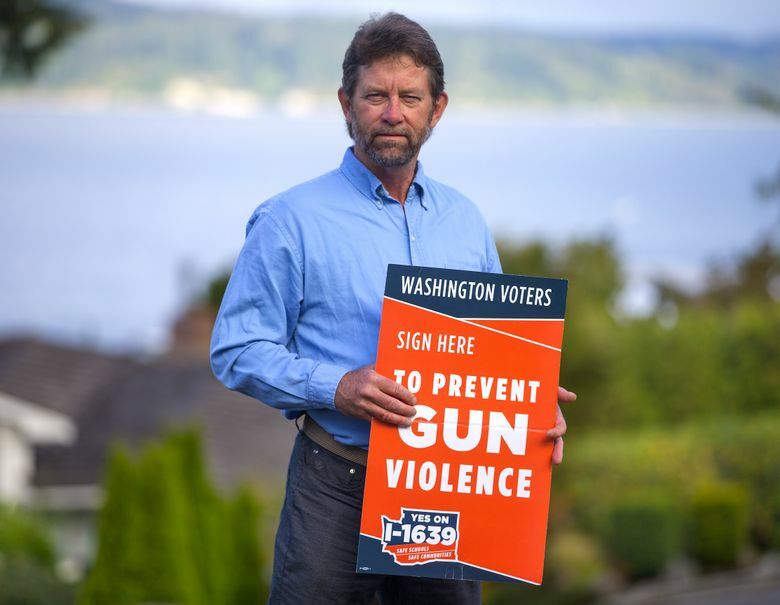 After his son was seriously injured in a shooting, Paul Kramer became the public face for Initiative 1639, the most ambitious gun-regulations ballot measure in Washington history. MUKILTEO — Over the years, Paul Kramer followed news coverage of mass shootings around the country and felt terrible for the victims and their families. That changed on July 30, 2016, when a teenager armed with an AR-15 semi-automatic rifle seriously injured his son, Will, and killed three others in an attack at a house party in Mukilteo. Now, Kramer, 57, is the public face for Initiative 1639, the most ambitious gun-regulations ballot measure in Washington history. I-1639 is the nation’s only statewide firearms measure on the ballot this fall, and it puts Washington back in the center of the debate over gun violence and constitutional rights. It comes after a continuing string of high-profile mass shootings that have become known by their locations: Newtown, Aurora, Orlando, Las Vegas, Parkland. As part of the campaign, Kramer attends fundraisers, rallies and newspaper editorial-board meetings to advocate for regulations that neither Congress nor the state Legislature have been willing to take up. Gun-rights supporters say the initiative would criminalize law-abiding firearm owners, make it nearly impossible for adults under 21 to defend themselves with a gun, jeopardize gun-owners’ privacy, and wouldn’t do much to reduce crime. They’re up against a campaign led by the Alliance for Gun Responsibility that has raised nearly $4.5 million so far. Of that, about $3.6 million comes from Microsoft co-founder and philanthropist Paul Allen, former Microsoft CEO Steve Ballmer and venture capitalist Nick Hanauer, or their family members. Former New York City Mayor Michael Bloomberg’s organization Everytown for Gun Safety has kicked in an additional $250,000. The NRA’s opposition campaign has raised $173,000 so far, with most coming from the organization itself. Save Our Security has raised about $24,300. The Mukilteo shooting launched Kramer into the deep cultural and political fault line in the debate over firearms regulations. In September 2016, he stood by state Attorney General Bob Ferguson as Ferguson proposed a ban on certain semi-automatic rifles in response to the shooting. That legislation died in the 2017 legislative session without getting a public hearing. This year, Democratic legislators in Olympia pushed hard for new gun laws. Some Republicans crossed the aisle to pass a ban on bump stocks and legislation to keep firearms from convicted domestic abusers. But even as the Parkland, Florida, school shooting that killed 17 in February revived efforts to more strictly regulate firearms, proposals in Olympia withered. A bill to raise the purchase age and increase background checks for buyers of semi-automatic rifles, as well as provide money for school-safety priorities that had been backed by Republicans, didn’t get a floor vote. By that point, Kramer said, the Alliance for Gun Responsibility had started work on a possible initiative — and organizers approached him to be a citizen sponsor. The Mukilteo shooting is a case study for why Kramer and other gun-regulation advocates want a higher purchase age and a waiting period to get a semi-automatic rifle. Allen Ivanov bought the AR-15 about a week before he shot Kramer’s son, Will, who was 18 at the time, and killed Jordan Ebner, Jake Long and Anna Bui — who were all 19. Bui was Ivanov’s former girlfriend and he was angry that she had rejected his efforts to reconcile, police said. Apparently unfamiliar with the weapon, Ivanov, who also was 19 at the time, studied the gun’s manual in his car immediately before his attack at the house party. He pleaded guilty to three counts of aggravated first-degree murder and two counts of attempted first-degree murder. When he was sentenced to life in prison, Ivanov himself blamed “the ease of acquiring a gun” as one reason for the shootings. I-1639 defines a semi-automatic rifle as one that uses energy from firing a cartridge in order to chamber the next round and “requires a separate pull of the trigger to fire each cartridge.” Long guns that use manual operations — such as pumps, slides, levers or bolts — could still be purchased at 18. In addition to the current federal background check, I-1639 would require purchasers of semi-automatic rifles to have other checks, similar to buyers of handguns in Washington. To pay for the cost of the records checks, the initiative authorizes the state Department of Licensing to require firearms dealers to charge a fee up to $25, which could increase over time. I-1639 directs the state to annually check that owners of handguns or semi-automatic rifles are still eligible to possess such weapons. While semi-automatic rifles have dawn attention for being used in mass shootings, data shows that handguns are used more often. “There’s a reason for that; it has to do with concealability,” said Daniel Webster, director for the Center for Gun Policy and Research at Johns Hopkins University. Gun-rights supporters were working against I-1639 even before it made the ballot. argued the petitions used to gather initiative signatures were unlawful because they didn’t show exactly how the initiative would change the language of existing gun laws. A Thurston County judge agreed and knocked it off the ballot. Initiative supporters appealed, and the state Supreme Court reversed the judge’s order. Now, the NRA has set up a website arguing the initiative would have little impact on reducing violent crime because handguns are used in most firearms-related crimes in Washington. The website argues that the measure deprives 18- to 20-year-olds of a constitutional right to self-defense — although they could buy other types of long guns. “But since it has the semi-automatic component, all the sudden it’s an assault rifle,” he said. The NRA is working with Washington-based gun-rights groups to mobilize volunteers to make phone calls and go doorbelling to oppose the initiative, said Dalseide. Among his many criticisms of the initiative, Phil Watson, of Save Our Security, pointed to the provisions to keep records on gun owners, as well as the new fees. “The only real reasons to keep the universal registry are for taxation or to later try and ban firearms and go after citizens,” Watson wrote in an email. He also questioned whether the Department of Licensing could be trusted to keep such information confidential. Kramer dismissed arguments against the initiative, saying that with so many firearms so readily available — and so many gun deaths — some regulations are needed.